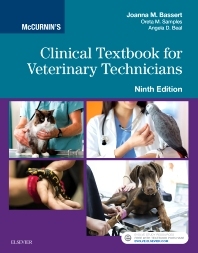 Immerse yourself in every aspect of the veterinary technology field with McCurnin’s Clinical Textbook for Veterinary Technicians, 9th Edition, covering small and large animals, birds, reptiles, and small mammals. With a new zoonoses theme threaded throughout each chapter, this comprehensive text describes how each disease affects the host, how it is spread, and how it is treated. Case presentations provide you with relevant, real-life scenarios so you can practice your critical thinking and decision-making skills.